17-10-04T19:03:04.027464+00:00 info applmgmt-audit 2017-10-04T19:03:04.277: INFO Authentication request -- "user:"primp@PRIMP-INDUSTRIES.COM", action:"system.listMethods", result:"success"
17-10-04T19:03:04.043748+00:00 info applmgmt-audit 2017-10-04T19:03:04.277: INFO Authentication request -- "user:"primp@PRIMP-INDUSTRIES.COM", action:"system.listMethods", result:"success"
17-10-04T19:03:04.058065+00:00 info applmgmt-audit 2017-10-04T19:03:04.277: INFO Authentication request -- "user:"primp@PRIMP-INDUSTRIES.COM", action:"system.listMethods", result:"success"
17-10-04T19:03:04.076688+00:00 info applmgmt-audit 2017-10-04T19:03:04.277: INFO Authentication request -- "user:"primp@PRIMP-INDUSTRIES.COM", action:"com.vmware.appliance.system.uptime.get", result:"success"
For general shell usage, as noted earlier when you logged into the VCSA, it is mostly NOT logged. Having said that, depending on the tools you use, it may still be logged at the application layer which you can find in some of the logs. In general, this is an area that Engineering is working on to improve and providing more comprehensive auditing capabilities for ANY user that accessing the VCSA whether that is via the API and/or direct shell access. If there is any feedback or requests that you may have, feel free to leave a comment and I will be sure to forward this off to the PM and the Engineering teams. thank you for this article. I added our admin AD group to the mentioned group (it was already in the SSO Administrators group). However, I cannot log in to VCSA SSH using my domain user (format: user@dom.tld), though I can log in with root user. 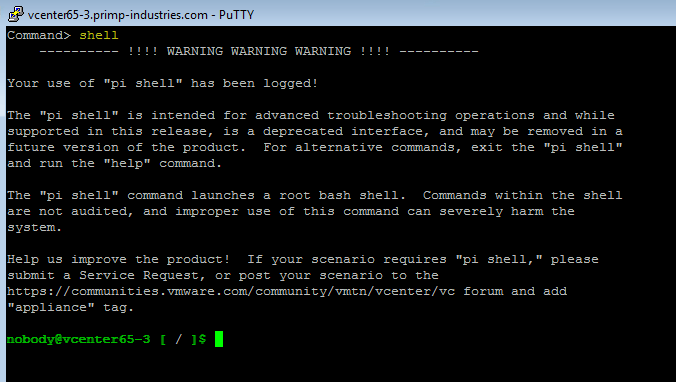 bash is set as default shell in my VCSA. There is a known issue when using this with an external PSC and users part of lots of AD groups. AD users which are part of lots of AD groups are not able to login to the appliance when they are part of a high number of AD groups. The issue is being investigated by engineering.